A befuddled Fed … As Jeff told me last week, Bill Dudley seems quite confused. That strong case lasted less than a month. Just this past week, Dudley told an Italian newspaper that it’s “still too early to think about raising interest rates” this year. That’s just what Jeff has been saying for years. Welcome to the party, Dudley! The reality, of course, is that not a lot has really changed. The world economy is actually a bit better than it has been in the recent past. Europe is picking up. The U.S. is muddling along. 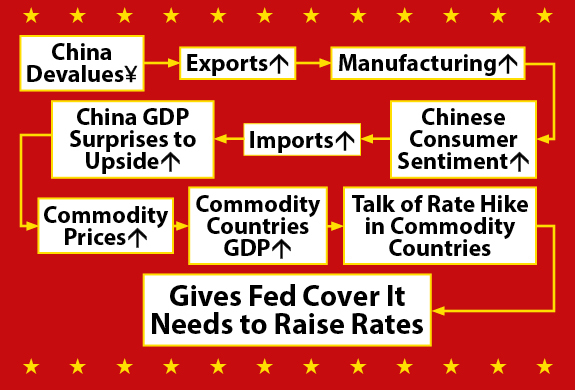 China has been a problem, for sure, but that’s largely a function of the strong U.S. dollar making the Chinese economy less competitive (the yuan is pegged to the buck, so when the buck goes up, so does the yuan, making Chinese goods more expensive). But that’s a temporary problem; it will reverse itself as soon as the dollar weakens (and that day is on the horizon). The reality that has not changed is that the Fed cannot — and will not — put itself in a situation that would ruin a fragile world economy. If you thought the global financial crisis of 2007 to 2008 was bad, then you don’t want to see the destruction that would ensue if the Fed raises rates. Too many companies and countries — particularly in Asia — have taken on way too much ultra-cheap dollar-denominated debt in recent years. Raising interest rates here at home would jack up their repayments while weakening their currencies. They’d face a situation in which they would need more and more local currency to buy more and more dollars to repay their debts. In short, they’d face a currency crisis that would rip through the region and ripple around the world, even here at home. Second, as I regularly point out, the U.S. simply has way too much debt. Just as higher rates would cause Asian companies and countries to find more cash to repay their loans, D.C. would face the same — only worse. Between 2009 and 2014, dollar-denominated loans in the developing world roughly doubled to about $4.5 trillion — so a vaguely $2 trillion increase. Here in the U.S., the likes of Barney Frank and Harry Reid and Nancy Pelosi and the rest of their crew on the short school bus have taken us to more than $18 trillion in debt from about $10 trillion. So let’s call that an $8 trillion swing. In simple terms, we have four times the problems of the developing world. Worse, we have bitterly divisive politics, and politicians who have grown up believing the B.S. about debts and deficits not mattering. We’re already about to slam into the debt ceiling unless Congress raises it — again. A new cycle of rising interest rates would ensure that Congress would have to raise the debt ceiling every single year, since when it comes to cutting spending, D.C. has the intestinal fortitude of a frontier-economy traveler with food poisoning. U.S. debts would balloon out of control at some point and we’d find ourselves in a debilitating debt spiral. As I mentioned at last week’s Total Wealth Symposium, the Fed is waiting for one thing: the other central bankers around the world to begin talking about raising their own interest rates, which would weaken the greenback and give the Fed the cover it needs to raise rates without risking a crisis elsewhere. That day is coming. It started when China devalued its yuan in August, as you can see below. I lay out the rest in November’s Sovereign Investor, so look for it in your inbox soon. In the meantime, as trite as this is sounding: Buy gold. These are the moments when insurance is cheap, and gold is the only insurance against a financial screwup. Gold is just one part of the plan to protect yourself and your wealth before the debt hits the fan. As Jeff said, we have four times the problems of the developing world, and if there’s a financial screwup, the fallout will rip through the globe — and it will clearly hit those in the U.S. In fact, one economist is already seeing signals of a coming collapse. To read his analysis, just click here. Another step closer to a global government … Earlier this month, plans for a global crackdown on corporate tax avoidance hit the news wires. And the consequences are troubling. More than 60 governments agreed that they would close loopholes, enhance transparency and limit the use of “tax havens.” This is the crowning moment of the G20’s two-year overhaul plan, known as the “base erosion and profit-shifting” project or BEPS, which was launched as a result of unseemly competition between countries to attract tax-avoidance investments from big tech firms, such as Apple, Google and Facebook. Driven by the Organisation for Economic Co-operation and Development (OECD), this project promises to patch up the many sordid holes in the international tax system. Which is great … in theory. But the globalized regulations that’ll spring from this project have far wider implications than most people are talking about. As Ted told me, it’s a plan with a double-edged sword, and we should start preparing for the fallout. Let’s say you and I own a global digital-tech business, each with our own legally separate division. My division is registered in a high-tax jurisdiction (the U.S.) and yours in a low-tax jurisdiction (Luxembourg). My division invents a profitable new patent. Wouldn’t it be great if we could make it seem that most of our global profits come from your division? It would. So my division “sells” the rights to the profitable patent to yours at a trivial price. Since your division now “owns” the patent, I have to pay you license fees to use it in my division (even though we invented it and paid all the research and development (R&D) costs). You jack up the fee to a level that results in most of my division’s revenue being “spent” on your license. Voilà! My division’s profit vanishes and yours swells, since you’re making so much in license fees from me. On paper, our profits in the U.S. appear small whilst those in Luxembourg are huge. Overall, we’ve reduced our tax bill. The OECD rules disrupt this in two ways. First, they require financial institutions to share information on financial accounts held by corporations with their own governments, who would then share them with other governments. So for example, your Luxembourg bank would have to reveal how much money is coming in to your division, and from where. Luxembourg would then share this information with the IRS. This “information exchange” enables the second disruption of our little scheme. The IRS can now use the financial information from our Luxembourg operations to assess whether the price they paid for our valuable patent, and the price we pay to license it, makes market sense. For example, they could review our past tax returns to see all the associated R&D costs we deducted from our U.S. taxes over the years. They could also measure the profits generated by actual operations in the U.S. and Luxembourg. When all that’s taken into account, if the price I charged you for the patent isn’t what I would have charged an unrelated party, the IRS can tax my division as if your profits were mine … since, after all, they basically are. So one edge of this sword is that companies won’t be able to shift profits to low-tax jurisdictions. That’s bad for them, but perhaps not for most of us, since it shifts the IRS’s enforcement attention away from individuals like you and me. But the other edge of the sword is that it strengthens the emerging “one-world government,” at least as far as taxation is concerned. Most modern economic activity (by value) is now globalized, and this is one more piece of evidence that systems of governance are following in that direction. Like the recently concluded Trans-Pacific Trade Partnership treaty (TPP), which grants tech, pharmaceutical and entertainment corporations monopoly-entrenching rights that negate the laws of the countries in which they operate, the OECD tax rules override national sovereignty in favor of international systems chosen by bureaucrats, not voters. Nineteenth-century political economists, such as Karl Marx and John Stuart Mill, predicted that capitalism would eventually lead to the decline of nation-states in favor of global government. Many people scoffed at them for years for their views. They were wrong about oil … Ever since oil producers (namely the Saudis) began pumping more black gold in their race for market share, and oil plunged almost 60% since June 2014, talking heads have claimed we’re living in an exciting new frontier of low oil prices. As you know, Jeff has pointed out time and time again how the Saudis’ race to take control of the oil market can only end in oil’s climb back into the triple digits. Oil supply is at record levels, yes. But the resulting low prices simply can’t sustain the necessary production and exploration costs. It’s already starting to hit the industry, as we highlighted recently. And now Barclays commodities analysts have confirmed just that. A little over a week ago, they sent a research report to clients saying low oil prices aren’t long for this world. The report stated that prices aren’t going to stay stifled nearly as long as markets are expecting. Because, simply put, oil companies won’t be encouraged to produce since they’ll be losing profits. The report stated: “With capex [capital expenditures] expected to fall by 20% globally in 2015 and a further 5-10% in 2016, the stage is set for a supply crunch.” Basically, capital expenditures have been waning because of oil’s fall, just as Jeff expected. Soon supply will dwindle as existing fields exhaust their resources and expensive new projects are put on hold. And that will send oil soaring past $100 again. In the TSI portfolio … Sabana REIT (Singapore: SSREIT, buy up to S$1.25), our unique Singapore-based real estate investment trust (REIT), announced that third-quarter gross revenue climbed 1.5% and net property income rose 1.4%. This is solid news for a REIT located in a country with sluggish growth. As you know, Jeff believes things in Singapore will turn around as the economy continues to recover, so we expect the company to top those results. For one, Singapore’s third-quarter GPD expanded, meaning it narrowly escaped a recession. And as we have often said, Singapore remains a critical hub for the oil, gas and financial markets in Asia, a region that houses some of the fastest-growing economies in the world. With a well-diversified REIT structure — it doesn’t concentrate more than 20% of its properties in any one sector — Sabana is in a great position to benefit as the country recovers. As the economy picks up pace, it will start boosting prices for its properties, raising rents for tenants and securing higher occupancy rates. At the moment, Sabana has an occupancy rate at 91.7%, up from 90.9% last quarter. And while it has 10 leases set to expire by the end of the year, it believes eight of those will be renewed, with just two being converted to a multi-tenant structure. Singapore’s REIT industry will also get a boost from another area: Recently, the country’s existing policies were altered to improve the sector’s performance, allowing REITs more flexibility over leasing durations and the pool of eligible tenants. It’s also important to note that Sabana is a Shariah-compliant REIT, which means that the majority of its investors are there for religious reasons. So its share price should remain relatively stable compared to the rest of the market since its investors won’t be so quick to bail on shares. Sabana is paying us its S$0.0177 dividend on November 27. Our shares are up 7% at the moment, largely thanks to the 30% return from dividends. The company still pays out a significant yield, standing at 9.4% based on its current price, so shares remain a buy up to S$1.25. In dividend news … Goldcorp (NYSE: GG, buy up to $20) dropped its regular monthly dividend of $0.02 into your account this past Friday.